Many factors need to be considered when developing watering sources for livestock. Adequate amounts of water are needed to maintain high levels of production. Limiting water intake reduces animal performance quicker and more drastically than any other nutrient deficiency (Boyles). Improving springs or seeps by excavating, cleaning, capping or providing a collection and storage area improves the distribution of water and preserves water quality. The trough or tank should have adequate capacity to meet the requirements of all livestock. This should include the stor age volume necessary for carry-over between periods of replenishment. The trough or tank, when installed, should be a height compatible to the size of livestock using the structure. Travel distance may determine how stock come to the water source to drink. Studies have shown that when cattle graze less than 600 to 900 feet from water, the stock go to drink individually while animals traveling over 1,000 feet to water will travel as a group (Gerrish & Davis, 1995). If group watering occurs, the tank should hold a minimum of 25 percent of the daily herd requirement (calculated from Table 1) and allow five to ten percent of the animals to drink at one time, providing a space of two feet per head. Tank refill time should be no more than one hour. When livestock travel individually to water, a tank that allows two to four percent of the animals to drink at one time and a flow rate that provides total daily needs in four hours is needed (Bartlett, 1996). Drinking space and volume of water are important considerations to assure slow or timid animals adequate time to drink before the herd leaves the watering area. A trough or tank should be made of materials that can be expected to remain functional for a number of years (10 minimum). Concrete tanks and heavy equipment tires are popular choices that will render many years of service when developing watering areas. Automatic water level control and/or an overflow should be provided in all tanks. Overflow pipe may range in size from 1¼ inch plastic to 4 inch polyvinyl chloride (PVC) pipe, but overflow water must be piped in a desirable direction for release to reduce erosion or creating a wet spot in the field. The top of the overflow pipe should be adjusted to allow approximately 2 inches from the water surface to the top of the tank. Any valves or pipes exposed in a system should be covered to protect them from livestock damage. Local Natural Resources Conservation Service (NRCS) offices can provide schematic drawings with this information. When using heavy equipment tires as tanks, cleaning the inside of the tire may be necessary to remove calcium residues. Equipment operators sometime add a calcium mixture inside of tires to add weight to the machinery and residues from this may be harmful to livestock. To calculate capacity of a tank, use the formula below that most closely resembles the shape (top) of your tank. 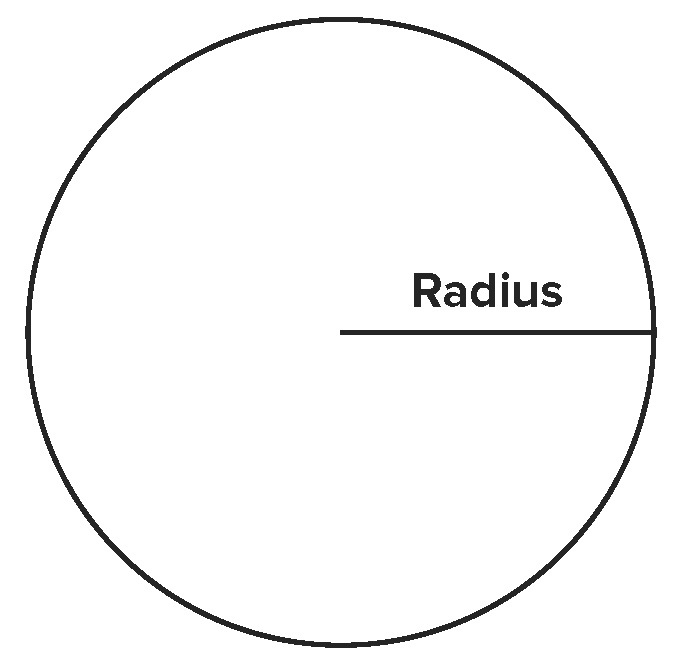 Example: radius 42 inches, water depth 24 inches. Example: length 84 in., width 36 in., water depth 24 in. These water capacities may also be calculated to show gallons of water per inch within the tank. This figure may be important if livestock cannot reach the bottom of the tank and you want to know the amount of water available for them, or if the tank is partially empty and you need to know the amount remaining in the tank. To do this, divide total tank capacity (gallons) by the depth. 575 gal. ÷ 24 in. = 23.9 gal. per in. If water begins from rock fractures, the individual openings should be cleaned and enlarged as needed to promote increased flow. The water from these individual openings should be collected and conveyed to a central catch basin by means of tile, perforated pipeline or a gravel-filled ditch. Where a collection trench is to be used, the trench should be at least 2 feet wide and dug to a depth, through the seepage layer(s), that extends into the underlying impervious layer at least 6 inches (if possible), but not through it. Perforated collection pipe is laid in the trench and backfilled with a minimum of 6 inches of well-graded gravel or stone filter material on the sides and top of the pipe. An impervious cutoff wall of well tamped clay, masonry concrete, plastic liner or other suitable materials should be constructed along the downstream side of the trench, as needed, to insure the water flow enters the collection system. The collection system should consist of drain tile or perforated pipe not less than 3 inches in diameter. The outlet from the collection system should be a watertight pipe. An impervious cutoff wall must be installed along the outlet pipe where it joins the collection system. The cutoff wall should be of concrete at least 8 inches thick, tamped clay at least 2 feet thick or a plastic membrane of at least 10 mill. thickness. The minimum projection of the cutoff wall should be 2 feet and should be installed perpendicular to the centerline of the outlet pipe. A minimum grade of 0.1 percent should be provided throughout the collection system and flow to a catch basin. The catch basin (first accumulation point) should be approximately 18 inches wide x 36 inches in height. Location of a catch basin must be an adequate distance below the elevation of the seep to permit free discharge of the water. Placement of the catch basin should be situated so the top of the basin is a minimum of 4 inches above ground level and have a watertight lid. The entry line from the seep plane (water source) should enter the catch basin approximately 18 inches to 24 inches below ground level when possible. For sites with strong spring flows of water that will exceed the capacity of the outlet pipe (to the tank), an overflow pipe should be installed in the catch basin. The overflow pipe should be 3 inches to 4 inches in diameter and conduct excess water to a suitable area. For the outlet of the overflow, use a rigid pipe having a minimum length of 8 feet and equipped with a suitable animal guard to prevent obstructions being formed inside the pipe. Flexible water line or PVC pipe should be used from the catch basin to the trough. In the catch basin, install the outlet pipe 6 inches to 8 inches above the concrete bottom. The outlet pipe must not be so high as to cause a backup of the spring that would reduce flow. The pipeline from the catch basin to the water trough should be designed with a minimum grade of 0.5 percent without high spots to help prevent air locks. Pipelines should be buried a minimum 36 inches in northern Ohio and 30 inches in southern Ohio to avoid freezing. This pipe should be a minimum of 1¼ inch diameter plastic and extend upward approximately 1½ feet through the bottom of the trough. All pipeline joints should be water tight and tested prior to backfilling. Backfill should consist of loose material, but avoid using rocks, which may damage the pipeline. A foundation area should be cleared of all material not suitable for the subgrade such as mud, manure, or vegetation. The foundation area and the close surrounding area should be smoothed to permit free drainage of any surface water. Backfill of any underground pipes should be compacted to prevent settling after construction is complete. Disturbed areas should be graveled, paved, or reseeded and mulched to control erosion. Placing 6 to 8 feet of gravel 6 inches thick around the trough/tank will aid in providing sure footing during wet periods. Multiple trough/tanks may be connected down a valley or hillside to make efficient use of collected water. Connecting lines between tanks should not have high or low spots in the line to eliminate air-lock problems. A catch basin between tanks is recommended to trap sediment and maintain a quality water supply. *Note: Many variations may be encountered when developing a water source. Alterations to specific plans may be necessary to make a system work. Contacting local NRCS personnel is advised for site specific recommendations. Livestock still need water in cold weather. Winterizing tanks and pipelines is often necessary to prevent freezing and ice accumulation in winter. Directing the inlet pipe along the side of the trough to promote water circulation reduces the chance of freezing. Water warmers may be placed in troughs to prevent ice accumulation. Propane tanks and batteries can serve as an energy source in remote sites. Underground pipelines are winterized if they are installed correctly (see pipeline section). Pipelines that may be exposed or laid on top of the ground should be drained before freezing weather to avoid bursting. Algae can clog overflows or possibly create toxic conditions in a livestock water trough. Sunlight and warm temperatures, combined with nutrients, may promote algae growth until control measures need to be implemented. Periodically cleaning the tank to reduce nutrients slows algae growth. Applying Copper sulfate crystals (see chart below) controls algae growth (Snyder Industries Inc.). Apply every 2 to 4 weeks as needed. Dissolve crystals in warm water and pour throughout the tank to achieve best results. 0.5 teaspoon 1.5 oz. 350 gal. 1.0 teaspoon 3.0 oz. 675 gal. 1.5 teaspoon 4.5 oz. 1000 gal. 2.0 teaspoon 6.0 oz. 1350 gal. 3.0 teaspoon 8.0 oz. 2000 gal. Chlorine bleach is another option to help reduce algae growth. Each week add 2 to 3 oz. of chlorine bleach for each 50 gallons of water capacity in the tank. Bleaches (without scents) are recommended. Copper sulfate or chlorine applications do not require livestock to be kept away from the tank, but best results are obtained if the active ingredients concentration is maintained for at least 5 minutes. Withholding livestock access for the recommended time may achieve better results. Ponds can be a good source of water for livestock, but access must be controlled to maintain the integrity of the structure and water quality. Water can be delivered from a pond to a trough for livestock use by gravity, siphoning or pumping. When a gravity or siphon system is used, the supply lines to the watering troughs should have an inside diameter no less than 1¼ inch. A minimum of two anti-seep collars at least 24 inch diameter should be firmly attached to the pipeline when a line is placed under or through a dam. A water supply intake should be used when removing water from a pond. The intake should remove water 1½ to 3 feet below the surface and a screen or filter should be placed on the intake. When used, valves should be protected from frost damage and installed so they are accessible from the ground surface by means of a capped stand or well. Water can be pumped from a pond by placing a submersible pump in the pond or a drafting basin. Nose pumps at access points from the pond may also be used to pump water. All lines should be placed at proper depths to protect them from freezing (see pipeline section). Pressurized water systems can be very useful to the farm manager, but specific design for each operation is usually necessary. Manufacturer specifications need to be followed for pump style, distance water must be transferred, quantity of water to transfer, pipe diameter and elevation changes. More information about pressurized water systems may be found in the Great Lakes Basin Grazing Network and Michigan State University Extension publication, Watering Systems for Grazing Livestock. Water availability can be the most limiting nutrient in livestock operations. Properly collecting and distributing water throughout the farm can have tremendous benefits. Ample supply of good quality water is necessary for maximum production. Easy access to quality and plentiful water supplies may increase livestock productivity. Sound environmental practices may be enhanced by correct use of a water source. Boyles, S., Livestock and Water, Ohio State University Extension, The Ohio State University, ag.ohio-state.edu/~beef/library/water.html (no longer available online). Gerrish, J., & Davis, M. 1995. Water requirements and availability. Missouri Grazing Manual, pp. 75-81. University of Missouri, Forage Systems Research Center, Dept. of Agronomy, Columbia, MO. Getting Started Grazing: An Introduction to Management—Intensive Grazing, Ohio State University Extension, The Ohio State University. https://ohioline.osu.edu/gsg/index.html (no longer available online). Natural Resources Conservation Service, Ohio Field Office Technical Guide. Section IV, Engineering Standard Spring Development, February 1988, Pipeline, June 1986, Trough or Tank, February 1988. www.oh.nrcs.usda.gov (no longer available online). The authors would like to thank Dr. Stephen Boyles, Ohio State University Extension Specialist, Beef Livestock Management, Dr. Karen Mancl, Ohio State Professor and Extension Water Quality Specialist, Dave Miller, Ohio State University Extension Farm Management Specialist and Clif Little, Ohio State University Agricultural Extension Educator, for reviewing this information.